Greta Van Susteren is America’s longest-serving news anchor. Her program, On The Record, is the top-rated show on cable news in its time slot. 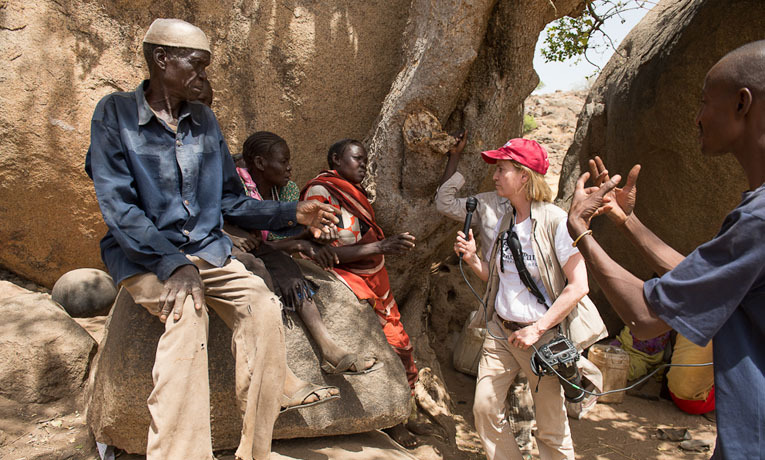 She has a heart for the people of the Nuba Mountains, frequently calling attention to their plight. She traveled to the war-torn region with Samaritan’s Purse President Franklin Graham last year. In an entry on her blog, GretaWire, Van Susteren once again calls for people to get involved. President Assad of Syria is killing his people. So is President Bashir of Sudan. I am not taking a position on whether we should or should not arm the Syrian rebels, but I am curious why or how we decide who to help. No one—except perhaps here on GretaWire and YOU—is talking about Sudan and the Nuba Mountains. Why are the politicians not even talking about Sudan and the Nuba Mountains? “I check GretaWire every day and find news there that I don’t find anywhere else.” –-Franklin Graham. If the test of who we help is our national security interest—the people of Sudan’s Nuba Mountains would also top our list because Sudan’s President Bashir is ‘best friends’ with Iran, providing such things as locations for Iranian munitions factories to arm Hezbollah, and don’t forget that Sudan gave safe haven to Osama Bin Laden in Khartoum early on (and who knows who now, right?). Iran is not our friend and Iran is buying time to build a nuclear weapon which will change the world forever. If the decision about who we help is oil, Sudan should be high on the list of our attention. Sudan has total control over the pipeline from the oil fields in South Sudan and those oil fields are big! When I was in Sudan and South Sudan last spring with Reverend Franklin Graham and Samaritan’s Purse, I was told by South Sudan officials that the oil through those pipelines supply China with 6% of its big oil appetite. That is a giant amount! Do you know what happens if that oil flow stops? China will have to go elsewhere to get oil (where we go! )—and that will force the worldwide oil prices up. Yes, even your commute will get more costly. If the decision to help or not is about our good friend Israel, Nuba Mountain rebels should top the list. As noted above, Sudan’s President is pals with Iran—and helping Iran get more arms. And who do you think Iran wants to threaten with those arms? Israel! The list goes on and on… tell me….why do you think no politician is talking Sudan? By the way, as a blogger here, my guess is that YOU know more about the crisis in the Nuba Mountains of Sudan than any of your elected officials or friends or coworkers. If you want to help these people, just spread the word. Email this posting to everyone you know…and send it to your elected officials. It just takes all of us pointing the spotlight on this crisis to start the dialogue. I don’t have the answers, but I do know when a crisis is ignored. We need to be talking about this one.